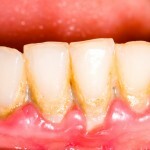 Periodontal diseases (PDs) are very common worldwide and are associated with a range of systemic disease e.g atherosclerotic cardiovascular, and rheumatoid diseases. As patients often live with no or few symptoms (bleeding, swelling tooth mobility) they are often considered to be ‘silent diseases’. The aim of this review was to investigate associations between clinically measured PDs (gingivitis and periodontitis) and impairment of Oral Health-Related Quality of Life (OHRQoL), and to analyse a potential influence of disease severity on the degree of perceived impairment. Original studies (observational, epidemiological studies and clinical trials) investigating a possible correlation between OHRQoL and PDs in patients aged ≥ 16 years using standardised and validated OHRQoL questionnaire were considered. Methodological and reporting quality was evaluated using the Newcastle Ottawa Scale. Results were synthesised using a vote counting method. Eight different, in part, culturally adapted questionnaires were used to assess OHRQoL . The shortened version of the Oral Health Impact Profile OHIP-14, was applied most frequently (17 studies). 28 studies reported a significant association between PDs and OHRQoL or OHRQoL subdomains. 8 studies reported increasing impact with greater disease severity or extent. There is evidence for an association between clinically diagnosed PDs and subjectively assessed OHRQoL, with greater impact on OHRQoL with increasing severity or extent of PDs, a dose–response relationship. Hence, PDs play an important role in the impact of oral health on the QoL in affected individuals – and consequently should not be considered silent diseases. Since recognition of this association was enhanced when full mouth recording of PPD was performed, clinical implementation of a comprehensive periodontal examination is recommended, in combination with completion of a survey on OHRQoL. As the authors highlight in their discussion the review is limited by the variation in measurement approached for both PDs and OHRQoL. A range of periodontal parameters were used to measure PDs and many of the studies used partial rather than full mouth recording of disease status. The reviewers point out that in studies with full mouth recording stronger impairment with disease status was noted. The discussion focuses on the studies that reported a positive link between PDs and OHRQoL and there is limited discussion of the 11 studies that did not find an association. Buset SL, Walter C, Friedmann A, Weiger R, Borgnakke WS, Zitzmann NU. Are periodontal diseases really silent? A systematic review of their effect on quality of life. J Clin Periodontol. 2016 Apr;43(4):333-44. doi: 10.1111/jcpe.12517. Epub 2016 Mar 29. Review. PubMed PMID: 26810308.